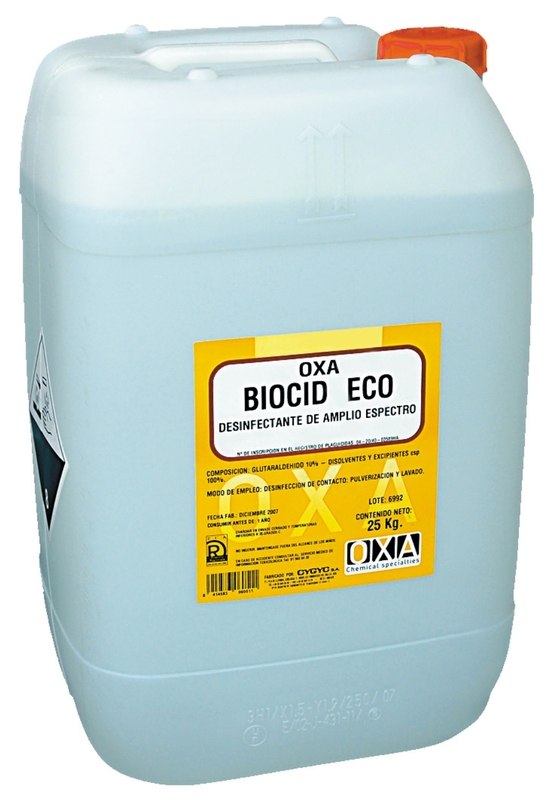 BIOCID ECO has been formulated to be an effective, stable and manageable disinfectant. Its stabilization system allows a powerful action Glutaraldehyde very broad spectrum: bactericidal and fungicidal. However it is not easy to use corrosive and neutral product. Dairy Industries, Breweries, Meat, Catering, Juices and Beverage, Pharmaceutical, Paints, water cooling circuits, etc. Bins for disinfecting by immersion in the food industry to use a concentration of 1 to 2% in water. For environmental spray application, dose of 10 to 12 cm3 / m3 of pure product. Apply in the absence of staff in the room and completely ventilate the room before occupying again.